When traveling any distance in the United States, it is easy to think of flying directly from your home to your destination. While it is often expedient, and you may get to spend more time at your destination, you can miss so much along the way. You may find a great restaurant, a spectacular view or something truly weird. Yes, weirdness abounds out there in America and the roadside attraction is the culmination of an individual’s passion and commerce. I have passed a number of these on my travels around the country and a couple stand out. I was in Ohio’s Amish country (eastern Ohio) and headed to Columbus for a football game when I reached the top of a hill and noticed to my left there was a picnic basket off to the side of the road. Now this was not any ordinary basket, it was a six-story tall basket that was actually an office building for the Longaberger Basket Company. It was an incredible that it looked so much like a real picnic basket. Take a look here. The second was actually a place that I built into a trip the family took a few years back. We flew out to Denver and after spending some time there, went north to Cheyenne for the rodeo and later onto see Mt. Rushmore. As we were flying back out Denver, we had a drive back to make from South Dakota and as there were several viable paths, I knew I wanted to take a different path than the one that got us there. Luckily for me, this new path took us very near an attraction I wanted to visit in western Nebraska. Unless you are a farmer or rancher, you generally don’t find much in that part of the state, but there is something out there – Carhenge. Carhenge is a replica of England’s Stonehenge but made with 38 automobiles. They are arranged to match the original blocks and are painted a uniform color to make sure one does not stand out over the other. I found its quirkiness perfect for me. My boys thought it was fun as well, and the Ranting Wife, while she went along with it, was not impressed at the stop. You’ll be impressed with the flavor of this chicken. I don’t buy a roasting chicken very often. Getting the basting sauce ready. 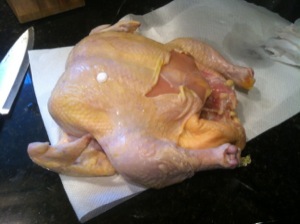 Clean and dry the chicken. In the pan with vegetables. 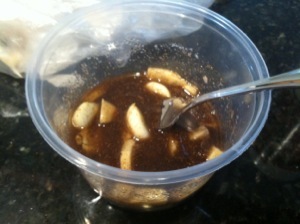 In a small bowl, mix together 1/4 cup oil, garam masala, ginger, garlic, and 1 tablespoon salt. Place chicken in a large baking dish or plastic bag, loosen the skin from the breast and legs of the chicken and, using your hands, spread a good part of the mixture underneath. 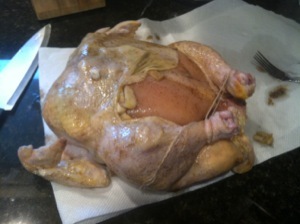 Rub the remaining mixture inside the chicken cavity and over the skin. Tie the legs together with kitchen twine. 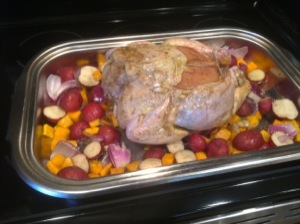 Loosely cover, refrigerate, and let marinate 30 minutes or up to 12 hours. Arrange the rack in the center of the oven and heat oven to 400 degrees F.
Remove chicken from marinade, let any excess drip off, and reserve marinade. 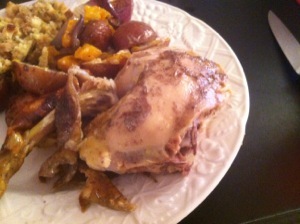 Let chicken sit at room temperature while oven warms up, about 30 minutes. When the oven is heated, place potatoes, squash, and onions in bottom of a roasting pan, drizzle with any remaining marinade, remaining 1/4 cup oil, remaining 1 tablespoon salt, and season well freshly ground black pepper. Toss to coat. Place chicken, breast side up, on top of vegetables and roast until skin becomes brown and vegetables are starting to get tender, about 1 hour. 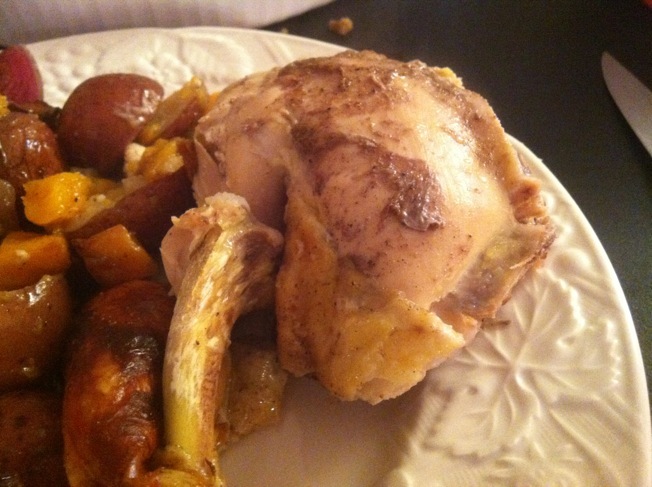 Brush yogurt on chicken and continue roasting until chicken is well browned, juices run clear when inner thigh is pierced with a knife, legs move easily in the joint, and a meat thermometer inserted into the thickest portion of the thigh registers 160 to 165 degrees F on an instant-read thermometer, about another 40 to 50 minutes. 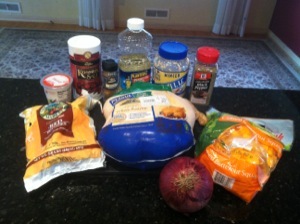 Let chicken rest at least 10 to 15 minutes before serving. ← Diced! Dessert Round 3 – Voting is now open!